Video of the animal was captured by Hans Nilsson. Aug. 15, 2017 12:30 p.m. Many of us living in Canada have seen our fair share of moose. They are often larger up close than one would first expect, and are a common sight in northern parts of Canada and other countries with boreal forests that sit in the Northern Hemisphere. 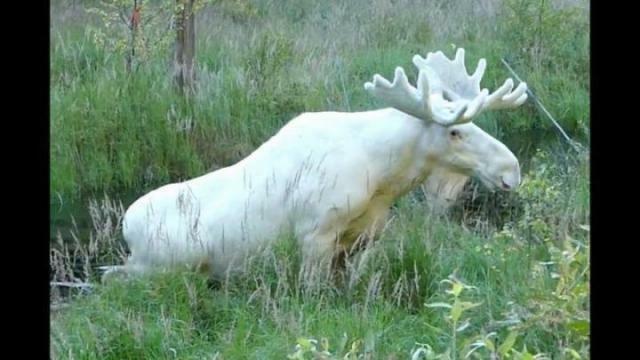 But it’s not everyday that someone spots a white moose. That’s what Hans Nilsson caught on camera earlier this month in the Värmland region of Sweden. The country is home to roughly half a million moose, but a very small percentage are completely white — most vary from the usual colours of almost black to a very light brown. It’s believed the colour could be from some kind of genetic mutation.